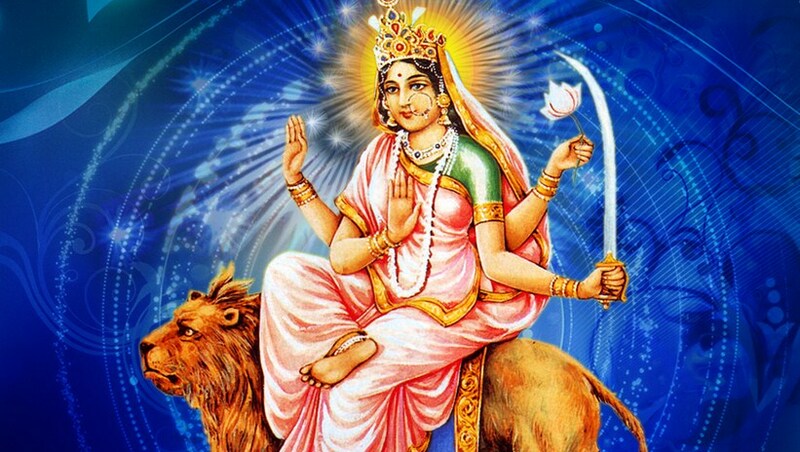 Ma Katyayani is the sixth form of Ma Durga. 6th Navratri is on 26th September. Ma Katyayani appearance is too clamming and divine. She has four arms carries sword, lotus flower, one hand is on Brahmudra and one hand is on Abhaya mudra. Ma Katyayani wears pink color saree and rides on the loin. It is believed that who do fast and do the chant for Ma Katyayani, Ma listens their all wishes and give happiness in their life. Devotees believe that if unmarried women do fast for Ma Katyayani she get husband according to her wish and if married women for fast and chant for Ma Katyayani, ma blessed them with healthy and wealthy life. According to Hindu Mythology, there was a Maharishi Kat, his son was Katyayan who is a great devotee of Ma Durga and he performed hard Tapasya towards Ma Durga. When Ma Durga ask him for his wishes he requests Ma Durga to take birth as her daughter. Ma accepted his wish and born as a daughter of Rishi Katya, being a daughter of Rishi Katyayan Ma named as Ma Katyayani. Ma Katyayni also ends the terror of Demon Mahisasur. Ma Katyayani kills Mahisasur as all Devta and Tridev (Brahma, Vishnu, and Mahesh) request to Ma Durga to Kill him. It is believed that Ma Katyayani becomes happy with honey. So devotees offer honey to Ma Katyayani and Ma help their devotees in their problem and make them happy. Katyayini Shubham Dadhya Devi Dan Vaghatini.